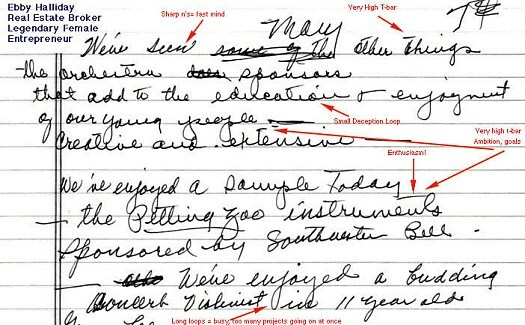 What does Handwriting Analysis reveal about Ebby Halliday? Judging by the abrupt changes in script style and slant, Ebby Halliday seems to be a woman who changes moods suddenly and frequently. Sometimes she can appear quite compliant, reserved, even methodical and calm, (soft "s", vertical slant and methodical garlands in second to fifth lines) however, she has a strong impulsive streak. Once she gets warmed up, she becomes very excited and demonstrative (strong right slant, words ascending towards end of the sample). She thinks very quickly (needle-point angularity on m's and n's, fast speed) and may get impatient with others who cannot reach conclusions as fast as she can. Her mind is focused on moving forward (relatively good horizontal tension increased by long dashes and expansive writing) and usually she has her mind on the next thing she wants to do before she is finished with her current projects. She is good at thinking on her feet and moves easily from one subject to another. She assimilates new information quickly and sums up situations swiftly. She also tends to have faster reactions and can work well in situations that require quick decisions. However, she may change her mind just as quickly. She can very easily change her position or point of view regarding any subject. Her focus on money or numbers can be seen in the letters that look like numbers (figure eight "s" and "z", "g" that looks like a nine, and letter "s" on the word "things" that looks like a two). She is mentally efficient (simplification of letters, few lead-ins) and direct. She tends to make her own rules and may break the rules (ignoring the left writing margin) if it means getting to the bottom line more quickly. For example, she may break the rules by using a variety of shortcuts to get things done or by telling little white lies on rare occasions (double-looped circle) to spare someone's feelings or when she gets emotionally involved. She is probably quite convincing. She can readily express empathy and feeling for others (rounded forms, right slant, garland finals) and she is able to connect ideas and express them fluidly (connectedness and figure-eight formations). She is also a good debater, perhaps argumentative at times, but she will argue her position skillfully and in an imaginative way (tall initial "p" stroke, sometimes forming a figure-eight). She is ambitious (high t-bars), and optimistic (upward slanting t-bars), and final hooks on words show that she has the tenacity to accomplish her goals. She channels a great deal of energy (wide lower loops) into her day-to-day activities (MZ emphasis) and focuses on doing, accomplishing and producing (goal-directed horizontal dashes). She finds it satisfying to be productive; her life is focused on activity and she is usually involved in several projects at once (tangled lines). She probably doesn't plan ahead too much but prefers to organize projects as she goes along (sudden script changes, wide lower zone loops, broad p stems). She does have the capacity to plan ahead and take more methodical steps toward reaching goals, (slower, methodical garland connections in lines 2 - 5) however, it is difficult for her to do so once the project is underway. She is better at developing alternatives in planning or problem solving as problems occur. The wide lower zone loops also suggest a great deal of nervous energy which may reveal itself in restlessness (also seen in inconsistencies) and a desire for change. She may even be slightly manic (sudden right slant and irregular baseline), and unable to control her energy and impulses, jumping in a hectic fashion from one thing to another. Overall, I would say that Ebby Halliday is a woman who is energized by new ideas and possibilities. She has a genuine fondness for people and may often be in helping roles. She is insatiably curious and thrives on change and activity; she keeps busy by surrounding herself with a variety of people and diverse activities. She is quick and clever and is able to capture people's attention easily. Her strengths include optimism, adaptability, creativity, and flexibility. Her weaknesses include unpredictability, impatience, and disorganization. If you have any comments about this handwriting, please submit your analysis of this handwriting sample via email to mail@myhandwriting.com for posting here on the website.